The new Instagram algorithm just became much more transparent. Since 2016, Instagram has largely been a mystery—that’s when the social media platform replaced its chronological feed with a secret algorithm. The idea behind the algorithm was simple: a chronological feed isn’t the best way for users to get the content they want. That’s why Instagram’s algorithm has been designed to better match users and content, simultaneously improving both user engagement and satisfaction. But users were understandably frustrated by the change. They just didn’t know how the algorithm worked or what it valued. Hoping to clear things up, the Facebook-owned company recently invited a group of tech journalists to a sit-down and they explained the basic principles behind the new Instagram algorithm. Today we’re going to explore what those journalists learned, and how you can use it to boost your brand’s visibility on Instagram. We’ll get into those specifics in just a minute, but the overall takeaway boils down to something like this: every user sees a unique feed designed to boost engagement on a personal level. In a way, the new Instagram algorithm makes a lot of sense: it ensures users are seeing more of what they like. But because the factors were opaque for so long, there was an inevitable sense of disappointment, like everyone was missing out on something. Now that Instagram has begun to explain what factors are involved in their algorithm, brands can begin to take the wheel and exert some influence over what they see—and how they’re seen. So what exactly does this mean? There’s a reason why Hey Tiger’s posts are always near the top of my feed. I love their glitzy, ostentatious, and often silly photos, so Instagram knows that I like seeing more of their posts. But while some of my friends follow Hey Tiger, they’re not all chocoholics, so if they aren’t engaging with the Australian chocolate brand often then their posts will probably show up lower down in their feeds. Pink Power cat party to start the last day of the week! Happy Friday friends! Leveraging the new Instagram algorithm can help you enjoy a competitive advantage over other users and businesses on this incredibly popular and powerful social platform. In other words, the more your brand knows about Instagram’s new algorithm, the more visible your brand can become. Instagram’s algorithm looks at 6 different signals when it weighs where to present content. The three most important features are Interest, Recency, and Relationship. Simply put, interest refers to how attracted to a certain post Instagram’s algorithm feels you might be. The new algorithm takes a look at your history: what you’ve liked, what you’ve scrolled past, what you’ve commented on, and what you’ve actively searched for. In other words, Instagram will take a look at your behavior and attempt to gauge how interested in a given post you might be, ranking them accordingly. There is even some suggestion that Instagram uses machine learning to take a peek at posts and try to figure out whether a user will like them or not. How can you leverage the “interest” factor of the new Instagram algorithm? Take a look back through your Instagram feed and take note of your most liked posts. Try to emulate the style and content of these posts in the future, as they’re more likely to be seen by a wider set of users. Brands should also take note of those previous posts that have generated the highest number of comments. Those are also worthy of emulation. In some cases, it might be worth taking a look through a competitor’s Instagram page, taking note of the type of posts that show the highest number of likes and comments. Give your followers what they want; it’s important that you appeal to the interests of your followers and signal this intent through the use of popular hashtags or commentary. The second of the three big factors that Instagram’s new algorithm looks at is called recency. Simply put, recency is Instagram’s way of ensuring your feed doesn’t get too far out of date. For fans of the chronological feed of yesteryear, recency is a big deal. The algorithm favors posts that are more recent—although, not exclusively. An emphasis on recency in the algorithm doesn’t necessarily mean that you’ll see a chronological feed. Rather, the intention seems to be to ensure that users are not inundated with out-of-date material. How can you leverage the “recency” factor of the new Instagram algorithm? Post regularly. Posting infrequently (ensuring you typically only have old posts) or all at once (ensuring that some of your posts are weeded out for certain users) can mean you aren’t maximizing the “recency” of your posts. Post at popular times of the day for users. This has long been an Instagram best practice for brands, and it remains true today even with the new algorithm. Make sure you’re using timely hashtags. It might sound obvious, but if today is a Wednesday, don’t use the #motivationmonday hashtag, as this may confuse the algorithm’s assessment of your post’s recency. There’s nothing wrong with posting more often as long as you don’t inundate your follower’s feeds. Every post should get a little bit of breathing room to help it take advantage of the recency factor. The third primary factor in the new Instagram algorithm is the relationship factor, and this is where engagement really starts to play a significant role. Under its new algorithm, Instagram is more likely to show you posts from people whose previous posts you have commented on or interacted with in some way. In other words, mastering this part of Instagram’s algorithm depends on putting the “social” into social media. People who comment on your posts are more likely to see future posts because Instagram assumes they like what you have to say and want to see more. How can you leverage the relationship factor of the new Instagram algorithm? Ensure you encourage comments on all of your posts. You can do this by asking questions or inspiring discussion. It’s also important that you respond to as many comments as you can. Comment on other users’ posts when you can and when it’s appropriate. You’ll want to remember your brand identity and be careful not to work against your brand. But users on Instagram will often return a comment with a comment. Tag people in posts; likewise, encourage users to tag your brand in posts. The more often you’re tagged, the more relationships will be formed and strengthened. Encourage engagement with your posts both on Instagram and in real life. Try proven strategies such as contests and prizes to coax engagement on posts. Remember that the best comments on your posts are going to be substantial—longer than 8 words. 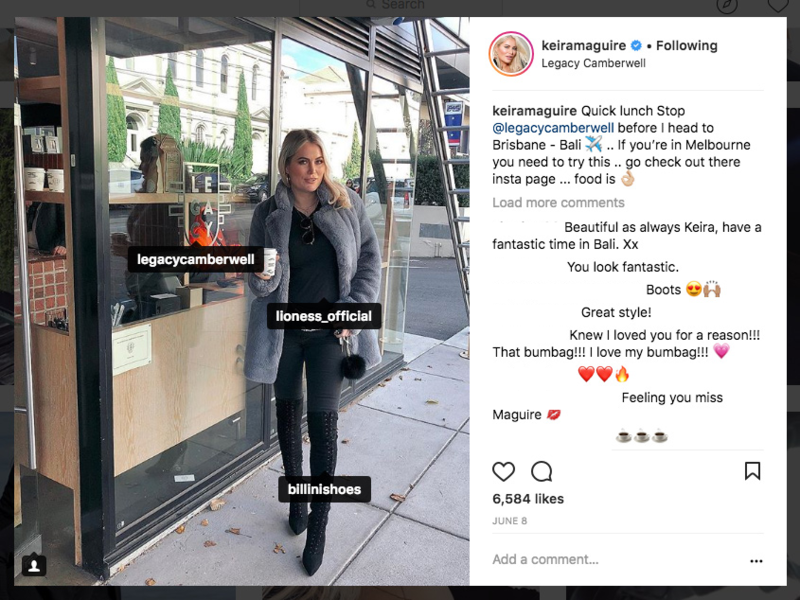 Here’s a quick example of tagging in posts: social influencer Keira McGuire always tags brands in her posts—and in turn receives free clothes, makeup and other goods from brands looking to leverage her 176,000-strong following. There were six algorithm factors in total that the engineers at Instagram discussed with journalists. The three signals discussed above are generally understood to be primary factors. In principle, these next three supporting factors round out the algorithm to give the best possible experience to users. Usage: The more you’re on Instagram, the more posts you’ll see. That seems to go without saying. But it’s important for the new Instagram algorithm to take a user’s general usage into account when building his or her feed. In short, the more time a user spends on Instagram, the deeper experience that user will generally enjoy. Frequency: Every time you open Instagram, the app works to create your feed. Naturally, then, the algorithm has to take into account just how often a user opens the app. Users who open the app more frequently may notice a more chronological-looking feed than users who open the app less often. Following: The look of a user’s feed will depend, to some degree, on how many people that user is following. The more people a user follows, the more posts are competing for space in that user’s feed. So, the total following will have an impact on which posts get selected for inclusion in a user’s feed. How can you leverage secondary algorithm factors? Because they’re a bit more potent, leveraging primary algorithm factors is perhaps a bit more straightforward than leveraging these secondary factors. However, knowing these secondary signals can still be incredibly valuable to your Instagram brand campaign. Many social media campaigns rely at least in part on social influencers—individuals who have a significant number of followers. Analytics on those followers can help you decide whether an influencer will be a good fit for these secondary factors. Doing a deep dive on how engaged your own brand is can help you determine the right level of engagement your brand should be striving for. If your brand has a significant number of followers but low-level engagement, these secondary factors could be part of the reason. For example, maybe many of your followers are following many others. Targeting new followers who are following fewer users could boost your engagement. These secondary factors can help ensure your Instagram strategy is moving in the right direction—and can help you troubleshoot when things aren’t going quite the right way. What’s not in the new Instagram algorithm? Because the algorithm has been opaque for quite some time, the team from Instagram spent a little bit of time helpfully clearing up some misinformation. We’re quite happy that they did because knowing what Instagram’s new algorithm isn’t is almost as useful as knowing what it is. You can avoid strategies that just don’t work—or that make faulty assumptions. Hashtag usage: Using hashtags—either repeatedly or often—will not penalize you under the new Instagram algorithm. Users can use up to 30 hashtags in any given post. Choosing to use all 30 does not penalize your post’s performance (nor does using a certain hashtag repeatedly). Instagram Stories and Instagram Video: Your participation in Instagram’s various features no longer help your post’s performance. So your post won’t perform better just because you posted an Instagram story at the same time (that said, such strategies can be quite symbiotic). Posting often: Unless you post more than 3 times a day, posting often will not necessarily produce a negative reaction from Instagram’s new algorithm. You’ll have to balance how many of your users are quite active (and therefore more likely to see multiple posts) with how often you want to post. The final thing that was cleared up in this meeting at Facebook HQ was this: there is no such thing as a shadowban. For brands who were worried about hashtag violations or dropping engagement, this is a significant relief. First, it means that brands don’t have to be worried about violating some unwritten rule and being exiled from meaningful Instagram interactions. It also means that drops in engagement or followers are correctable with the right strategy. If you’re a content marketer, social media manager, or brand expert, these Instagram algorithm updates will be pretty significant for you. It’s important to take some time to look at your current strategy and evaluate its strengths and opportunities in light of this new data from Instagram. Savvy brand managers will make adjustments to their strategy based on this new data. But in some ways, the best social media strategy remains unchanged: foster engagement on your social media account. If there’s one thing these new Instagram algorithm updates show us, it’s that there are significant rewards for emphasizing user interactivity, in getting your followers to interact with your posts. Is Instagram easier for brands to use now? This new information doesn’t necessarily make Instagram easier for brands to use or take advantage of. But knowing the new Instagram algorithm does make it easier to be more intentional. This information should make your goals as a marketer more clear: find a way to make a connection with your user. Give them something that will keep them commenting, keep them liking, keep them sharing. The specific strategy will vary by brand. But we can’t help applauding Instagram’s commitment to transparency. These type of algorithm updates helped decimate the marketing value of Facebook. It’s reassuring to know that Instagram has taken some of these lessons to heart. Leveraging the new Instagram algorithm won’t just make your account more successful. It will make your Instagram account better—and in the long run, that’s a marketing strategy win. The post The New Instagram Algorithm: How to Use It to Boost Brand Visibility appeared first on Revive Social.